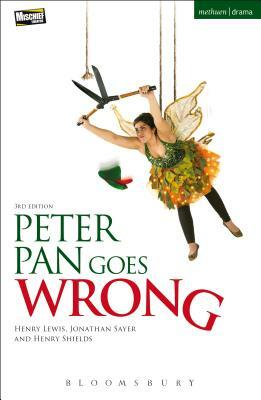 Peter Pan Goes Wrong (Modern Plays) (Paperback) | The Drama Book Shop, Inc. The inept and accident-prone Cornley Polytechnic Drama Society set out to present J. M. Barrie's classic tale of Peter Pan, their most audacious production to date. Flying? Pyrotechnics? Sharp hooks? What ensues is two acts of hysterical disaster. You'll laugh, they'll cry. Something so wrong has never been so right. From the mischievous minds of the West End and Edinburgh hit The Play That Goes Wrong comes this highly original, chaos-filled re-telling of J.M. Barrie's much-loved classic. Peter Pan Goes Wrong received its world premiere at the Pleasance Theatre, London, on 10 December 2013 and transferred to the West End on 4 December 2015. This edition was published to coincide with the West End transfer. Mischief Theatre is a comedy theatre company based in London, first formed in 2008 by a group of graduates and students of The London Academy of Music & Art. Since first forming the company has created and presented a number of productions across the UK and in Europe. The company is led by Artistic Director Henry Lewis and Company Director Jonathan Sayer.